Keep your drink cold for 12 hours with this Thermos Stainless Steel Vacuum Insulated Straw Bottle. Great bottle! Awesome price! My son loves it! This cup is great for keeping liquids cool. It works well except that it leaks out of the air venting hole. My son is 15 months so this cup is not working well for him as he constantly knocks it over and we get leaks everywhere. It would work better for older children. After many many tries this bottle is the winner with my kids. Happy to see a new colour so each kid has their own. Awesome for school, sports, and trips. Love these bottles. They work the best and we take them everywhere including travelling. The hardest part is making sure that you have a good bottle brush to clean the silicon bits but it's pretty easy because it all comes apart and goes back together. These are the best water bottles. We general like it but it leaks. My toddler was about 18 months when we got it and work up to being able to push to open it. In general we are happy with it and it does a great job but if our toddler decide to play with it and flip it up side down while the lid is open it tends to leak. We avoid to use it for car or bed time. Other then the leak when lid open and flipped upside down it's good. Would recommend using this one when supervision is possible or for older kids. 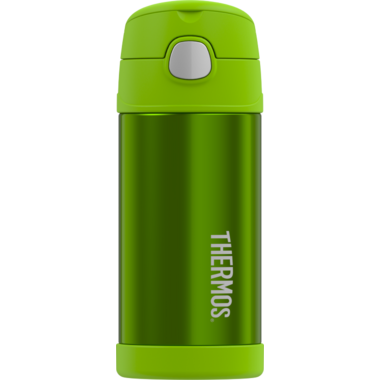 Bought this for my nephew who is 4 and will be starting school in sept. Appears to be great quality, as thermos brand delivers, although I've not used it to confirm that. My son takes this to school. It doesn't leak, keeps liquids cold and is easy to open. My 20 months old loves it si much... And me too! I is sturdy (my toddler can be quite rough on his stuff) easy to open and close for him, so he can manage his own water even in a car ride.